Simply Invoice software works in the UK, USA, Ireland, Australian, New Zealand, European and South African.This Simple to use software makes invoicing, quoting, contact management, bookkeeping, stock or inventory control and basic accounts quick and easy to manage. Designed to run small to medium sized businesses, Simply Invoice is fully network enabled. Create unlimited number of businesses and let Simply Invoice help you run your businesses smoothly and efficiently. With the ability to network up to 255 concurrent users/computers. Simply Invoice is a must for any small to medium sized business that wishing to get ahead and stay ahead of the competition. 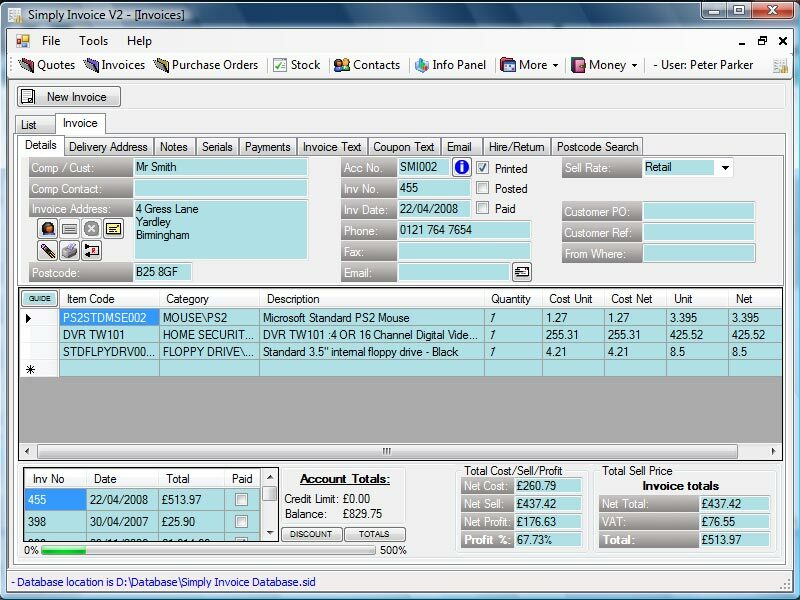 Implemented bookkeeping, New sales screen, EPoS hardware integration including cash drawers, receipt printers, pole displays and barcode scanners/readers. Fault reporting, Mail Shot via email or letter, Google Maps, Quote & Invoice header editor.